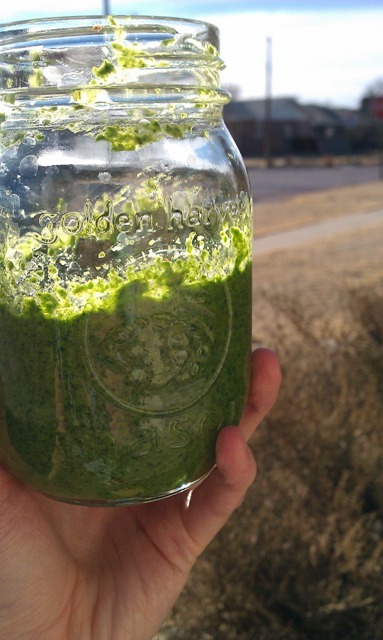 I’ve mentioned before that a great way to get through the lean months of fresh produce can be to make the most of what winter does have to offer, so for this week’s recipe, I decided to showcase a summertime favorite — pesto — that can very easily be shifted according to the seasons. Kim O’Donnel’s Meat Lover’s Meatless Cookbook has a great four-way pesto recipe, wherein the leafy greens and nuts are rotated out to accomodate seasonal flavors. 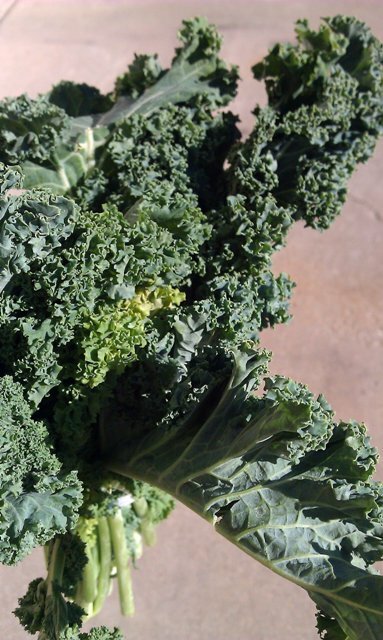 The winter variation just happens to use the very leafy green I had in my crisper drawer: kale! The original recipe can be found online (though I highly recommend this cookbook), and I followed it closely in terms of measurement. My only variations were that I did not toast the walnuts or pre-cook the kale (because I am lazy) and that I used regular curly-leaved, not lacinato kale. I also usually add the grated Parmesan cheese to my pesto per use, as I find it helps the pesto keep longer in the refrigerator. Making pesto is so quick and easy — only about ten minutes including chop time for the kale — and it has so many uses. Tonight, I plan to toss mine onto some potato gnocchi. Tomorrow, I will be brushing it on fresh-baked garlic knots. But you can be really creative with pesto. This summer, my friend Rachael and I were amazed to discover just how well (never home)maker’s recipe for Basil Pesto French Toast actually really does work. 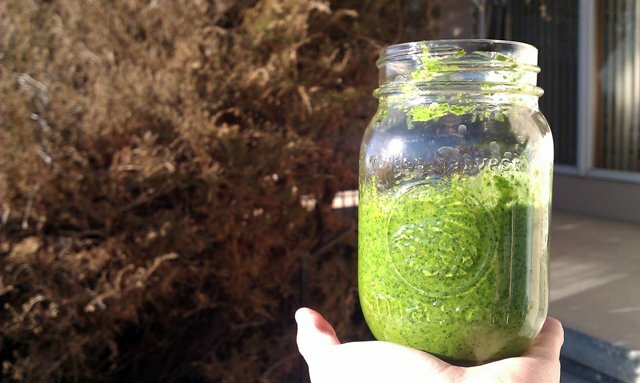 You can mix pesto into soups for extra flavor. Use it as a spread on burgers or a sauce on pizza. A marinade on grilled shrimp or salmon. Stir it into soup, succotash or chicken salad. The possibilities are endless! The sweet, garlicky tang of pesto can add a zing of summer to almost any dish. What’s your favorite pesto combination, or recipe? Do you have another powerhouse condiment idea to share with us all? Leave a comment and let us know!